Datamolino cannot update documents that are either "approved" or "voided" in Xero. If the document has been approved or voided in Xero after it has been exported from Datamolino, it is not possible to overwrite it by exporting the same document from Datamolino. The document was exported from Datamolino and later approved in Xero. You are trying to export the document again from Datamolino. Also, if you export from Datamolino with the status "Awaiting Approval" which can be set in "Folder Settings", it is not possible to overwrite the document after the first export. The document is approved in Xero. The document was exported from Datamolino and later voided in Xero. You are trying to export the document again from Datamolino. If you need the document again in Xero, please re-upload it to Datamolino and export the newly created document. The document was exported from Datamolino but Datamolino did not get a response from the Xero API in time. The document has still the status "ready" and you get an error if you try to export to Xero. Very rarely, but this may happen. Please contact our support team so we can troubleshoot this. 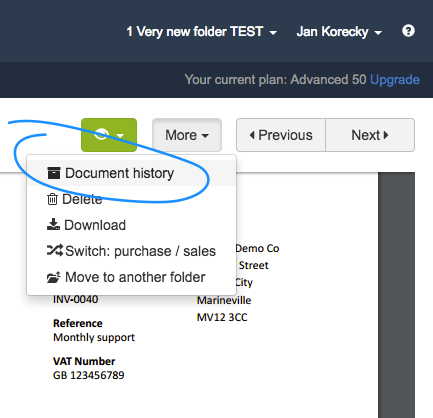 You can easily check when a document has been exported to Xero. When you are in the document detail, click on " More" and select "Document history".